Most Reverend Michael Byrnes is currently the Archbishop for the Archdiocese of Guam. 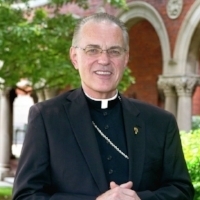 He served as Auxillary Bishop for the Archdiocese of Detroit, as well as Vice Rector, Dean of Formation and Assistant Professor of Sacred Scripture at Sacred Heart Major Seminary in Detroit. He served as Parochial Vicar of St. Joan of Arc Parish and Part-time Assistant Professor of Sacred Scripture at Sacred Heart Major Seminary. His Holiness Pope Benedict XVI appointed Most Reverend Donald Hanchon as Auxiliary Bishop for the Archdiocese of Detroit and Titular Bishop of Orreomargo in March, 2011. Bishop Hanchon had served as pastor of Most Holy Redeemer Parish in southwest Detroid since 1999. He has completed studies in Spanish and Hispanic Culture in Mexico and has served as a pastor in parishes serving the Hispanic community. A priest from San Antonio, Bishop Cepeda was named auxiliary bishop of the Archdiocese of Detroit ib April 2011 by Pope Benedict XVI. One month later he was ordained by Archbishop Allen Vigneron, becoming the youngest bishop in the United States at age 41. Bishop Cepeda had most-recently served as rector of Assumption Seminary in San Antonio. He was born in Mexico and immigrated to the U.S. with his family at age 19. Bishop Cepeda also serves as episcopal vicar and regional moderator for the Northwest Region of the Archdiocese. Fr. Riccardo is a priest of the Archdiocese of Detroit, MI. Ordained in 1996, he is the pastor of Our Lady of Good Counsel in Plymouth,MI, and the host of Christ is the Answer on many Catholic radio stations. Fr. Riccardo also serves as the Director of Evangelization for the Archbishop of Detroit. Fr. Mallon is a priest of the Archdiocese of Halifax in Nova Scotia, Canada. Born and raised in Scotland, he moved to Canada at age thirteen. He was ordained in 1997 and currently serves as pastor of St. Thomas Aquinas Canadian Martyrs Parish in Halifax. He is the founder and director of the John Paul II Media Institute. Fr. Mallon has been running Alpha for over ten years in various settings, is a member of the Global Alpha Catholic Board, and has participated in a Global Alpha Training conference in Mexico with several members of his parish. He serves as an advisor for Alpha in a Catholic Context within the U.S., and is the creator of a Catholic follow-up to Alpha, Catholicism 201, which is currently running in sixteen countries and has been translated into Chinese. Dr. Martin was named Consultor to the Pontifical Council for the New Evangelization and is the president of Renewal Ministries (www.renewalministries.net), an organization devoted to Catholic renewal and evangelization with a wide variety of mission work in more than 27 countries. He is also the Director of Graduate Theology Programs in Evangelization and an assistant professor of theology at Sacred Heart Major Seminary in the Archdiocese of Detroit. He is the author of a number of books including, The Fulfillment of All Desire: A Guidebook for the Journey to God Based on the Wisdom of the Saints. Dr. Healy is associate professor of Scripture at Sacred Heart Major Seminary in Detroit and senior fellow at the St. Paul Center for Biblical Theology andf has served for several years as the Coordinator of Mother of God Community, a lay Catholic community in Gaithersburg, Maryland. She is the author of Men and Women Are from Eden: A Study Guide to John Paul II’s Theology of the Body and co-editor of three important books on biblical interpretation. Since 1982, Dr. Minto has served in numerous capacities during his tenure at Franciscan University of Steubenville, which include: Tenure Board, Board of Governors, Core Curriculum Task Force , and Director of Graduate Theology, Franciscan University. Dr. Minto was the recipient of the Franciscan University Founders Award in 1999 and received Franciscan University's Campus Leadership and Teaching Award in 2004. Dr. Minto is also a Professor of Theology, teaching at the graduate and under-graduate level. Dr. Cooney-Hathaway is a professor of Spirituality and Systematic Theology at Sacred Heart Major Seminary in Detroit, MI, previously, teaching at the Washington Theological Union. Dr. Cooney-Hathaway is the author of Weaving Faith and Experience: A Woman’s Perspective. She is the project director for a grant from the Lilly Foundation for the education and formation of ecclesial lay ministers. Dr. Cooney-Hathaway has also traveled the nation giving lectures on various subjects, including theology, spirituality and the relationship between human and spiritual development. She is also a regular contributor to Mosaic magazine. Deacon James Owens is a Permanent Deacon for the Archdiocese of Philadelphia, PA. Ordained in 1999, Deacon Owens currently oversees ongoing formation of ordained deacons in the Archdiocese, as well as those men who are in formation to be deacons at Saint Charles Borromeo Seminary. Deacon Owens is an attorney who has litigated on behalf of those who advocate for the sanctity of human life from conception to natural death. Deacon Bob Ervin was ordained as a Permanent Deacon of the Archdiocese of Detroit, MI, in 2003 and is assigned to Holy Family Parish in Novi, MI. He spent his professional life as a mechanical engineer at University of Michigan and retired as Research Professor Emeritus. He directs the first year of deacon formation for the Archdiocese and serves in the charismatic Fellowship of St. Paul at Sacred Heart Major Seminary. He serves as a speaker at parish events throughout Detroit, fostering personal conversion to Christ and maturity in Catholic living by the power of the Holy Spirit. In addition, he and his wife teach regularly on Christian marriage. Mr. Lozano has over thirty five years of pastoral experience and is the author of Unbound: A Practical Guide to Deliverance, Resisting the Devil: A Catholic Perspective on Deliverance and The Older Brother Returns, as well as three children’s books. He and his wife have done outreach ministry, seminars and conferences in Poland, Latvia, Slovakia, Ukraine, Haiti, Turkey, Sudan, Uganda, Kenya and Rwanda. Mr. Lozano has become a respected authority in deliverance ministry and developed a unique, balanced approach to this often controversial area of ministry which includes detailed biblical grounding, real-life examples and immense practicality. Currently the Sr. Coordinator, Neal has served The House of God’s Light, a Christian ecumenical community for over thirty-five years. Mr. Michael Timmis, Esq., Phd. From Detroit, MI, Mr. Timmis has had a distinguished career as both an attorney and businessman, as senior partner of the law firm of Timmis & Inman L.L.P. Mr. Timmis was the recipient of the Business and Professional Award from Religious Heritage of America as well as an Honorary Doctorate in Humane Letters degree from the University of Detroit-Mercy in recognition of his civic and humanitarian contributions. Mr. Timmis also received a Doctorate from Ave Maria University, and is a director of numerous corporations, serving in a leadership capacity on the boards of many charitable organizations and foundations. Mr. Timmis and his wife Nancy are deeply involved in assisting the poor in the Third World and have developed self-help projects in Africa, Central and South America., as well as actively addressing the educational needs in the city of Detroit. Francisco “Paco” Gavrilides is a full-time Instructor of Homiletics at Sacred Heart Major Seminary and serves as the Coordinator of Catholic Men’s Ministry for the Archdiocese of Detroit, MI. He is a Trustee of the National Fellowship of Catholic Men, a ministry of evangelization and spiritual renewal of men in the Church. A conference speaker and teacher both in Spanish and English, he offers missions, conferences and retreats to parishes, charismatic groups, priests and seminarians locally, nationally and internationally. Paco with his wife have given marriage retreats for English and Spanish speaking audiences, as well as concerts of original inspirational songs. Before settling into parish and diocesan work, Paco served as a Catholic missionary of evangelization and Christian community formation for twenty years throughout Latin America.